If mooks wearing masks, Japanese crafting supplies, lovely gift tags and supplies, embroidery hoops as chalkboards and jewelry almost from a fairytale interest you then you’re in the right place. Welcome to this week’s edition of Etsy Take Five Tuesday! 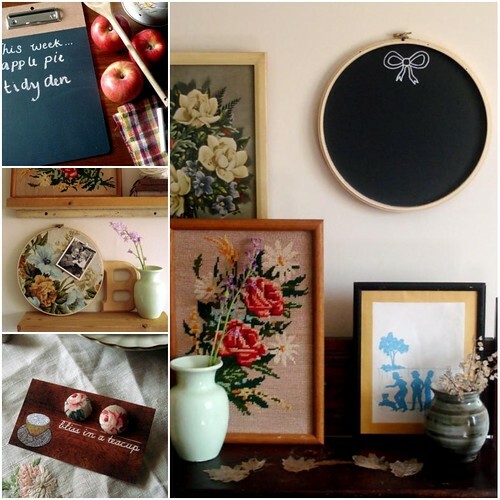 First up is Bliss in a Teacup, a sweet shop in Vancouver with embroidery hoop chalkboards and other fun things like writing slates and earrings covered with vintage fabric. Owners Richard and Rebekah also author a blog under the same name as their shop. 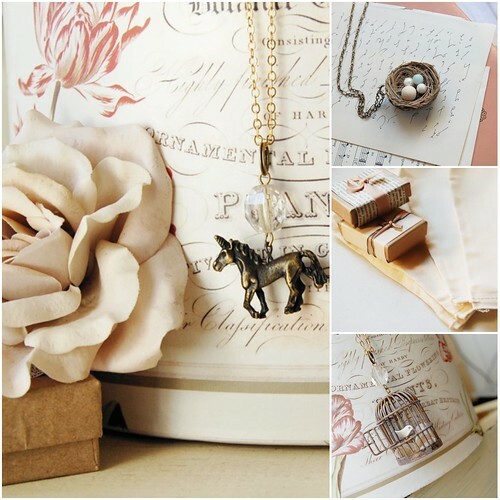 Enter the dreamy and romantic world of jewelry designer Jacquleen Bleu where unicorns, wishing wells and tiny bird cages invite you to dream a little dream as you browse her collection (expertly photographed, by the way). Psst: She writes a blog, too. Looking to do a little gift giving or throwing a bridal shower? May Third has lots of what you’ll want to keep in stock in your gift giving supplies drawer. Though she’s been selling on etsy for two years, I just found out about her work today and placed an order right away. 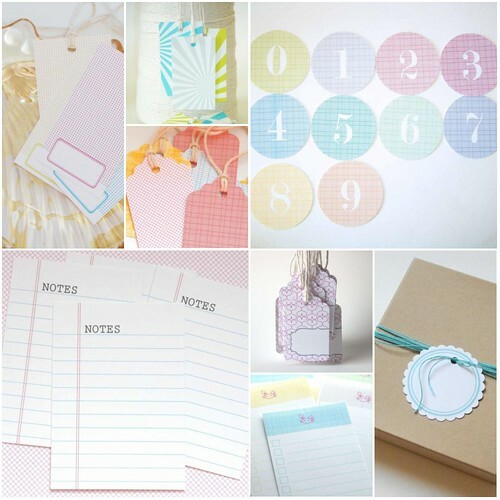 All items are printed on acid-free card stock using archival inks and can be customized to suit your needs. She also stocks supplies for packaging, like kraft boxes. I heart May Third and her style modern school girl style. 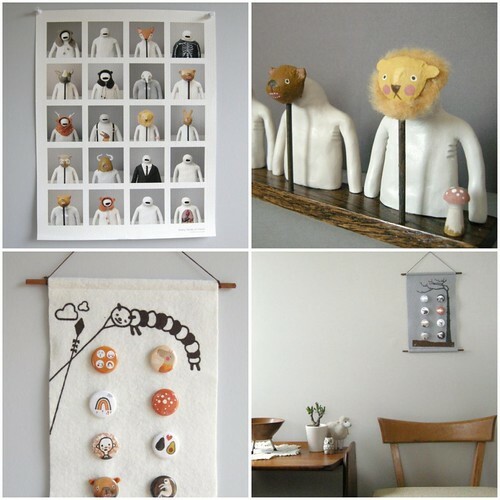 You can visit her on Flickr and at her blog (you’ll really like it) for more inspiration, too. If you love Japanese prints and patterns, the Choki Choki fabric shop is for you. 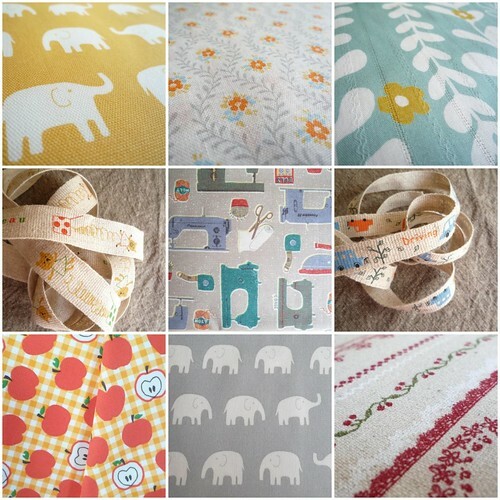 Lots of fabrics and trims to select from for your next crafty project from a very lovely seller, Harun, who is based in Japan so you’re buying direct. If wacky, slightly strange creatures called mooks (who wear masks!) are your thing you will give me big kisses today for showing you My Grey Sky. Too cute! My favorite product is the button holder since I have lots of badges that would be fun to display in this clever way.